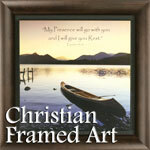 This stunning print has been mounted behind a stained cherry frame milled from one piece of wood. There are no miter cuts, joints, staples, or glue to hold it together. The corresponding verse is carved into the bottom of the frame to further enhance the print selected. There is no glass. The prints are protected by ultra violet light inhibitor, faux canvas treatment that allows for cleaning with a damp cloth. 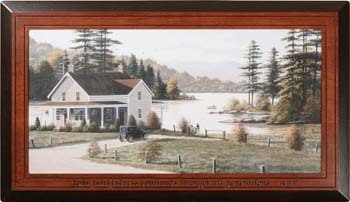 This print is entitled OUT ON THE LAKE by Bill Saunders. "Your faithfulness continues through all generations. Psalm 119:90." Measures 42" wide by 24" high. Weight is 16.48 lbs.